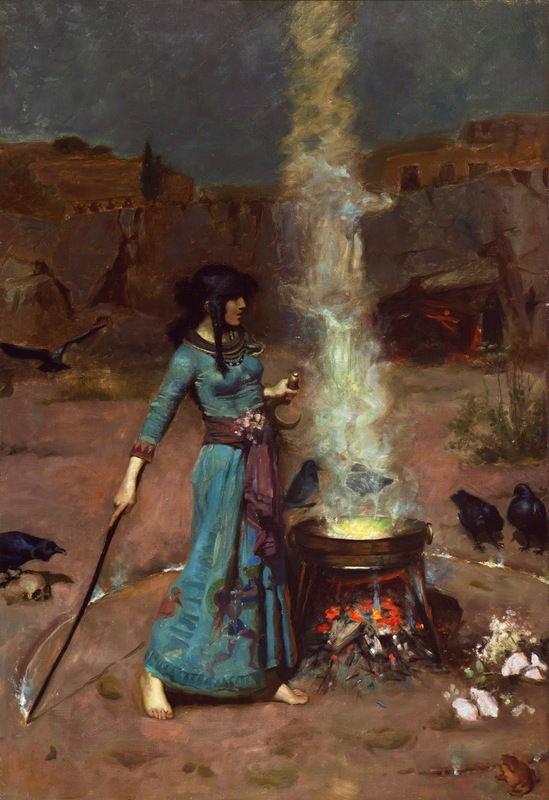 Those of you following this blog for three years or more may recognize the above painting, entitled The Magic Circle, by John William Waterhouse, from a previous post on the importance of the celebration of Halloween (All-Hallow's Evening) from 2014, entitled "Get ready for Hallowe'en! (And for All-Hallow's Day, with the teachings of Alvin Boyd Kuhn)." That post includes an explanation of Alvin Boyd Kuhn's argument that the celebration of Halloween is observed a significant forty days after the point of the September equinox. This equinox, the fall equinox for the northern hemisphere, is used by the ancient system of celestial metaphor operating in the ancient myths of the world as the point of incarnation: the plunge of the soul into a physical body. Forty days, Kuhn argues, contains an implicit reference to the forty weeks of gestation which take place between conception and the birth of a human baby. Alvin Boyd Kuhn argues that all the symbolism of Halloween can be seen as containing symbolism of the plunge of the soul from the realm of spirit into the physical realm of matter, and its temporary lodgment within a physical (or "animal") body. He explores this amazing insight in his 33-page booklet, Hallowe'en: A Festival of Lost Meanings, available online in its entirety here and available for purchase in physical book form on various booksellers (including online). Kuhn also argues that, along with Halloween, the following day of All-Hallow's Day is one of the most important of the entire year -- and that in fact the two celebrations are basically two halves of the same observance, one being the "night-time" element and the other being the "day-time" element of the same important commemoration. A previous post exploring his insights into that important day can be found here. Not mentioned in those previous posts, but certainly worthy of contemplation, is the fact that in previous centuries (and even to this day, in some countries) there was an association of All-Hallow's Day with the souls of departed loved ones -- and a tradition of going "souling" by asking for special cakes. The giving of these cakes was associated with bringing comfort to the souls of those who have crossed over from this life. In fact, the cakes are traditionally round in shape and marked with a cross. Intriguingly, although this custom is primarily associated with European cultures and with various forms of literalist Christianity, there is an important annual festival in China and other nearby cultures known as the Jung Chau Jit or "Mid-Autumn Festival" (literally the "Middle-Autumn Node") in which round cakes are traditionally given. These cakes are likewise round in shape -- and they are traditionally cut into four equal pieces and then eaten by sharing them with friends or strangers. The existence of these traditions in such widely-separated cultures speaks to the possibility that both may be descended from the same ancient system of esoteric metaphor which recognizes this part of the year as being representative of the incarnation of the spiritual nature in a physical body -- the "crossing" of our physical and spiritual natures, in this incarnate life. It is also interesting to note that the celebration of Halloween plays an important role in the original Karate Kid movie, from 1984. I have often used the methodology employed by Mr. Miyagi (such as the famous "Wax on, wax off") as an illustration for the concept of "the esoteric" method of conveying Gnosis, common to the ancient wisdom preserved in the myths and sacred stories from cultures around the globe. As those who have seen that movie know (and if you have not seen it, perhaps you should watch it before reading further), Daniel would probably never even have had the opportunity to learn from Mr. Miyagi, had he not been savagely beaten by Johnny and his Cobra Kai buddies after a contentious Halloween party and dance at their high school. That incident and some of its lessons was discussed in a previous post entitled "The Cobra Kai sucker-punch (and why we keep falling for it, over and over)" from September 11 of 2014. Halloween (and its "day-light" counterpart, All-Hallow's Day) are extremely important annual observances. I hope you have the opportunity to contemplate some of their timeless lessons, as we reach this significant station in the heavenly cycles, cycles which the ancients used to impart profound truths about spiritual, invisible realities.